That’s Radio Free Charleston 158, “Cap Seniors Shirt,” that you see at the head of this post. This episode of the show is named after the controversial shirt that was all over the news last week. 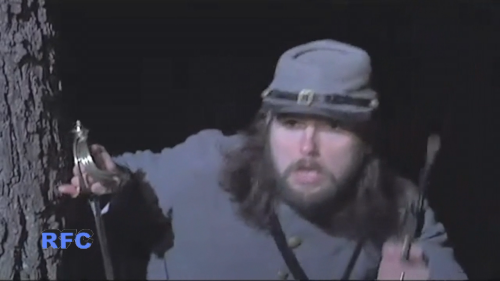 First up this week, we have a trailer for Dennis Strom’s much-anticipated Civil War short film, “One Soldier, One Grave.” Dennis premiered the film, which is narrated by Parkersburg native Paul Dooley and which stars Justin Johnson and Derek Samms, among others, last Friday night at the Alban Arts Center in St. Albans. Soon, the film will be available on DVD and we will keep you abreast of the details here in PopCult. As you can see from the trailer, it looks pretty epic. 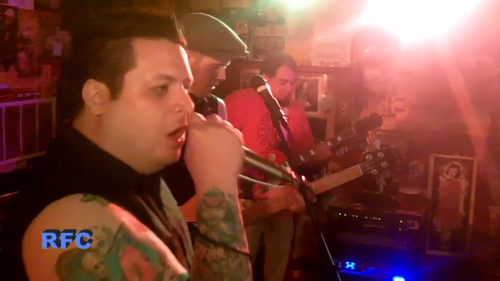 Speaking of pretty epic, our first musical guest this week is The Big Bad, who reconstituted themselves a couple of weeks ago at The Empty Glass. 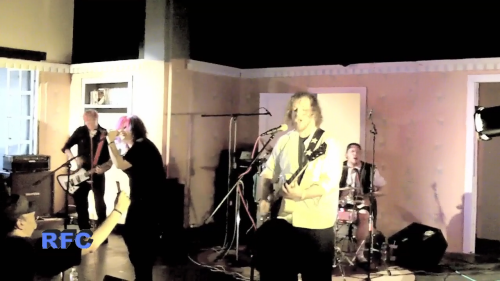 We’ve had the group on the show before, courtesy of an Eamon Hardiman directed music video, but this was our first chance to capture the band live. You’ll see them rip through two songs: the instrumental opener “Muertos,” and “Transylvania Is For Lovers,” which features some very energetic guest vocals by Roger Beane, the lead singer of Drop Ded Phred, who chimes in from the audience (from right over this cameraman’s head, in fact.) Word is there may be more Big Bad shows in our future. Our animation this week is “Odd Days,” which is credited as “a thing by Rudy Panucci.” That’s about as descriptive as it gets. Our next musical guest is Hurricane’s In The Company of Wolves, a band that I’ve been very excited about getting on the show. We caught up with them at Wood Boys Music’s benefit for pediatric cancer research earlier this month, and with the aid of Lee Harrah and Brandon Wood as camera three and four, we were able to go all out with a four camera shoot for their song “Holding On To You.” You’ll be seeing more from In The Company of Wolves on Radio Free Charleston over the summer. 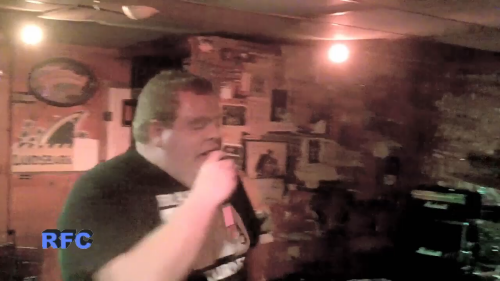 Wrapping up the show, we have another long time pursuit of RFC, Logan based rapper Foz Rotten. I’ve been trying to get Foz on the show for such a long time that our initial contact was via MySpace. We caught up with him at The Empty Glass, opening for The Big Bad reunion show and captured him performing his song, “Committed.” In the future, we hope to catch up with Foz when he’s backed up by the band Charlie Ant Eaterr. Eagle-eyed viewers may notice that, in introducing the performances this week, I blew two song titles. The reason has to do with our title shirt for this episode. If you’re not familiar with the story that was a big deal last week, a graduating Capitol High School honor student student designed an unofficial class t-shirt and sold over a hundred of them to his fellow classmates. 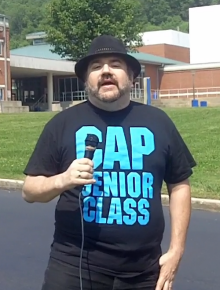 This unofficial shirt said “Cap Senior Class” on the front. On the back, over a paw print, was a list of humorous, but innocent in-jokes about the Class of 2012. This shirt outraged Capitol High School’s principal, Clinton Giles, for reasons that are still not understood by reasonable people. He claimed that abbreviating “Capitol” to “Cap” was disrespectful and he was upset that a paw print was used, rather than the official trademark mascot of Captiol High School, a leaping Cougar. 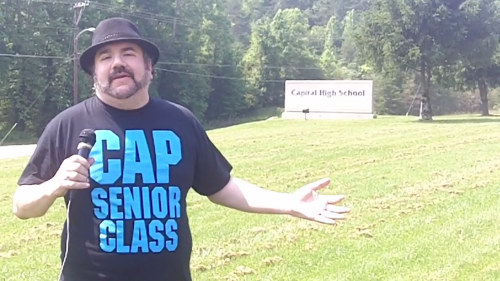 Aside from the fact that the creator of the shirt went out of his way not to infringe upon any of the school’s trademarks, and that the matter of the abbreviation “Cap” being disrespectful does not exist outside the mind of Mr. Giles, the strong-willed principal repeatedly threatened the students until a die-hard group of twenty-one who remained defiant were told that they would not be allowed to participate in the graduation ceremony. Let’s just step back and take a look at that for a moment. Because of an arbitrary line which he drew in the sand, Principal Giles was prepared to rob twenty one young adults of a once-in-a-lifetime rite of passage. Regardless of the fact that this makes him look completely insane, we also have to note that these kids could rightfully sue the pants off of the school system since this once in a lifetime experience could not have possibly been replaced, giant sums of money would instead be taken from the education of children and used to pay off the wounded parties as the only legal remedy. Luckily, the Kanawha County Board of Education stepped in and slapped down the little principal, reversing his decision and leaving him spouting off to the press about how his decision was only reversed because these were children of privilege. He was very concerned that a disrespectful act of youthful rebellion was encouraged. The fact is, it’s not disrespectful if the person toward whom it is aimed has done nothing to earn that respect. So with this episode of Radio Free Charleston, which we shot on the grounds of Capitol High School without asking permission, as I say in the show, we were merely lending our middle finger in support of the students. However, since my cameraperson, RFC Big Shot Melanie Larch, used to be a subsitute teacher in Kanawha County, and is well-versed in dealing with principal-sized petty dictators, she was very nervous during the shoot, and we wound up rushing through with me not even looking at the script. Hence the mistakes with the song titles and the chopping editing wound up in the show. Still, it was fun to do. Thirty-plus years removed from my high school days, I still think most principals are jerks. That’s about it for this week. This might be our first show where the shirt was a semi-big deal (but came about a week too late to matter to anyone), but we also think it’s a very strong show, musically and with our short films. 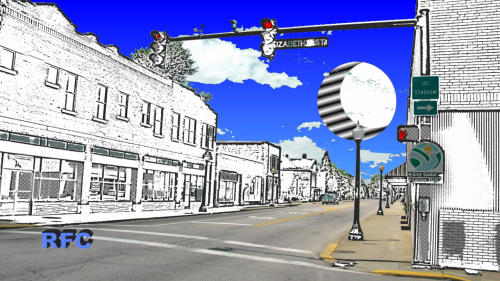 Radio Free Charleston will return in two weeks with an extended length show that will serve as a preview to FestivALL.